Japanese occupy island of Hainan in French Indochina. Over 4000 members of American Youth Congress march in Washington to protest US being drawn into imperialistic war; President Roosevelt angrily confronts them. London severs diplomatic relations with Romania. The RAF attacks the oil storage tanks at Rotterdam in the Netherlands. 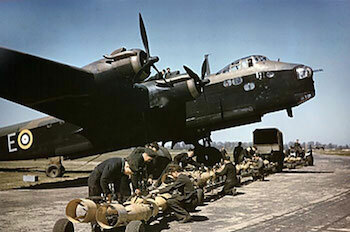 The raid sees the operational debut of the RAF’s first 4-engine heavy bomber, the Short Stirling. Iceland is attacked by German planes. The RAF makes its first operational drop of airborne forces (Operation Colossus). Six Whitleys of No. 58 Sqn drop 38 men to attack two aqueducts at Treviso in southern Italy. The war halts civilian car production at Ford. The former French liner Normandie capsized in New York Harbor a day after it caught fire while being refitted for the U.S.Navy. Wavell makes his last visit to Singapore, but by now there was nothing he could do to alter the outcome. First meeting of Pacific War Council in London with Dutch, New Zealand, Australian and UK representatives. The Russians begin to lay down a tremendous artillery barrage against the Korsun pocket, in an attempt to force its surrender. The allies announce that southern Italy is to be handed over to Italian government jurisdiction. The Japanese combined fleet leaves Truk for Palau. Australian and Americans troops link at Saidor in New Guinea. The U.S. First Army captures the seventh and most important Ruhr dam. Soviet sub S-13 sinks German transport General Steuben, killing 4500 military personnel fleeing East Prussia. The 2nd Belorussian Fronts attack towards Neustett is halted by desperate German counter-attacks. The 1st Ukrainian front reaches the Neisse encircling Glogau. Liegnitz is captured by the 1st Ukrainian Front. The remaining defenders of Budapest, some 16,000 men, try to break out from Budapest, although most are killed or captured. B-29s hit the Tokyo area.